Profiles in courage are not just found on the battlefield during war. All too often, the uncomplaining, silent endurance during pain, suffering and neglect of America’s veterans who were promised medical care and support by our Department of Veterans Affairs is another unremarked and underreported profile in courage. Kurt Lofquist criticized Barack Obama’s conduct as Commander in Chief, after his return from combat as a Marine in Iraq (youtube video) over a year ago. Lofquist, first came to public attention with a video he appeared in over one year ago criticizing the Obama Administration’s handling of the war in Iraq where he had served in combat. More recently, Lofquist’s Concerned Veterans for America has begun airing an internet video called “Zero” which describes the lack of accountability from the Obama VA in the care of military veterans, one year after the “Waiting List” scandal story broke. It has now been over one year since the news media’s discovery that there were actually two sets of records kept by many hospitals which were part of the Department of Veterans Affairs, commonly called “the VA” (it used to be the Veterans Administration). During that year, the GOP controlled Congress has increased the VA budget by $16 million dollars, despite which, the number of veterans waiting 90 days or more for medical care has nearly doubled. But during this period, no one has been fired for hiding the truth but in fact, several of the whistleblowers who helped reveal what sounds like criminal wrongdoing to this writer, were the only ones punished – ordered to stop caring for the veterans they had been helping, and to be put on administrative leave as their reward for telling the truth and trying to help veterans. “’What the hell’ is the exclamation from Congressman John Boehner, the Speaker of the U.S. House of Representatives, to describe his feelings about this scandal. Last week he said “Just one person has been fired. One,” said Boehner in a House floor speech, continuing, “What the hell happened to the rest of them?” (source: Freedom Leadership Conference). While this writer is in general agreement with the criticisms made against Speaker Boehner for the number of times he has not stood up for conservative principles and has even punished GOP Congressmen who have stood up for our principles, we do appreciate his speaking out on this scandal as he has. 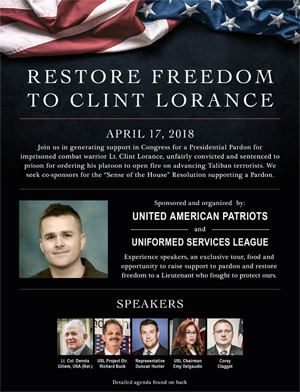 “A spokesman for Uniformed Services League (USL) observed that ‘if a taxpayer running a small business were to do the same thing – keep two sets of books – the IRS would turn them over for criminal prosecution, not just impose the correct tax when they found the truth.’” (source: ibid; note, USL is the second sponsor of tomorrow’s conference in Northern Virginia). The Conference website, based on reports from its two sponsors for the upcoming conference, reports that Boehner is so frustrated because at least 110 VA facilities “have been found to have kept secret wait lists to manipulate and cover up their actual, longer wait lists.” That’s what would be a criminal offense if a private company did the same thing the IRS would send a criminal referral over to the Department of Justice. Only the Obama Administration can change the culture from within” said Speaker Boehner in his floor remarks, which will be echoed tomorrow by principal speaker Kurt Lofquist at the Freedom Leadership Conference. Simpson will bluntly tell his audience the shocking news: the promises made by the American people to care for those who serve our country in uniform, are simply not being kept. Dr. Simpson will report in more detail tomorrow the case of Rick Thomas Tuff, Donjuan Williams and Andrea (last name withheld) – three of the more than 600,000 veterans waiting and waiting on the VA hospital system for the medical care they were promised when they served in the U.S. military. It is wonderful that Speaker John Boehner is so angry about this issue but the question is, will the Senate and the House stay focused on solving this problem and standing up to the “Culture of Deceit” that covers this up and hopes people will simply ignore this issue? Both organizations sponsoring the Wednesday nite Freedom Leadership Conference – Concerned Veterans for America and Uniformed Services League – strongly support passage of “The VA Accountability Act, introduced by House Veterans Affairs Committee Chairman, Congressman Jeff Miller, to empower the VA secretary to quickly remove any VA employee (not just senior executives) for misconduct or poor performance while also protecting whistleblowers, such s those punished for speaking out about this one year old, still unresolved scandal. Pete Hegseth, the CVA Chief Executive Officer, explained their new movie and why they are sponsoring tomorrow’s conference and continuing their efforts: ““One year after the VA wait list scandal first came to light, zero people have been fired for manipulating patient wait time data at VA hospitals. It is almost universally recognized that the Department of Veterans Affairs has an infected, toxic culture, but if there is no accountability or consequence for misconduct, that culture is never going to change, and veterans aren’t going to get the timely, quality medical care they earned and deserve” without further action by the Congress. Most of us have heard the epic poem by Alfred Lord Tennyson called “The Charge of the Light Brigade.” It celebrates and recognizes the gallantry and heroism of soldiers who follow their orders and put their lives on the line for their country. But what about those veterans who survived the ravages of war and their time in the service, how are they taken care of afterwards, how is the debt paid aside from a parade during Memorial Day or July 4th each year? Alfred Lord Tennyson’s poem is as silent on this score, as the Obama White House is today. As it turns out, the less known poem about the Light Brigade was written nearly half a century later, in recognition of the plight of those survivors of the Light Brigade who were getting no help from any source, even as schoolchildren of their day proudly and patriotically recited the uplifting stanzas from The Charge of The Light Brigade. British Army pensions and medical care in the nineteenth century left a lot to be desired. Things have improved today but, both then and now, untreated wounds and suffering left the veterans who put their lives on the line, who went “Into the mouth of hell” for their country, high and dry and bereft of the help and support they thought they had been promised. The dire circumstances of abandoned veterans, then and now, inspired Rudyard Kipling to write this. I conclude this article hoping it will inspire my fellow non-veterans to stand up now and demand Congress take action to force accountability on the Obama VA.
For we’re all of us nigh to the workhouse, an’, we thought we’d call an’ tell. Rudyard Kipling’s later poem, The Last of the Light Brigade, continued the story begun by Alfred Lord Tennyson’s original from 50 years earlier, The Charge of the Light Brigade. How about today? Is it possible a reading of this poem by more and more concerned Americans, might inspire them to put pressure on Congress to pass the VA Accountability Act and any other legislation needed to take care of our veterans so that we as a country do not shame ourselves by continuing to ignore them as they “depart, limping, lean and forlorn”? I most certainly do understand how Kurt Lofquist and his Concerned Veterans for America have no intention of letting anyone treat them as victims, but intend to face the future with the same strength and courage they exhibited on the battlefield. But this issue is not just about them and how they feel. It is about us, the American people, and whether or not we will honor the promise we made that in return for their service, we will provide them the medical care and support they need when their fight is over and their uniform is set aside. The shame is not nor will it ever be theirs. If we fail to act and to force the politicians to hold the Obama VA accountability, then the shame will be ours. It is my prayer that those who read these words and who attend tomorrow’s Freedom Leadership Conference, who hear the words of the two speakers there or later at the conference website, will stand up and “sweep the land like flame. This article is also cross-posted at REDSTATE and we urge you to visit there, post comments there, share that article and follow REDSTATE as I do. I urge coalition-minded conservative readers to follow Freedom Leadership Conference on Facebook, or to visit their website and sign up for their free email newsletter, at Freedom Leadership Conference (or both). As a very longstanding Human Events and REDSTATE subscriber and Young Americans for Freedom supporter (from the mid 1960’s), I am a coalition conservative and welcome new like-minded friends at Facebook. So find me –Glenn Ryt– and mention this article. This entry was posted in Announcements, conservative news. Bookmark the permalink.